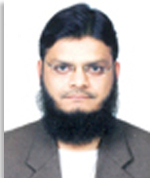 Mr. Muhammad Rasheed Arshad joined the Department as a Lecturer on February 26, 2103. He earned his Master’s degree in Philosophy from the University of the Punjab in 2007.In his MA Philosophy, he was awarded K. B. Sheikh Nanak Bakhsh Silver Medal, and Khawaja Ghulam Sadiq Gold Medal by the University of the Punjab. He had also done Bs (Hons) and M.Phil in Islamic Studies from International Islamic University Islamabad and MBA from the Hamdard University. Philosophy of Religion, Ethics, and Postmodernism are his major areas of interest.